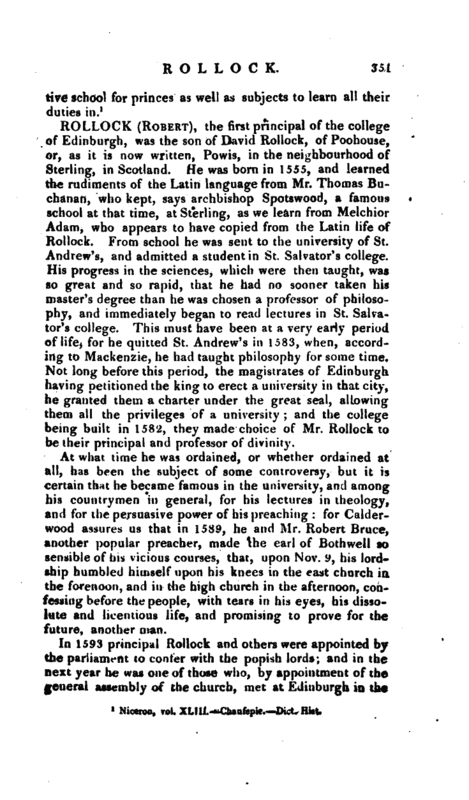 , the first principal of the college of Edinburgh, was the son of David Rollock, of Poohouse, or, as it is now written, Powis, in the neighbourhood of Sterling, in Scotland. 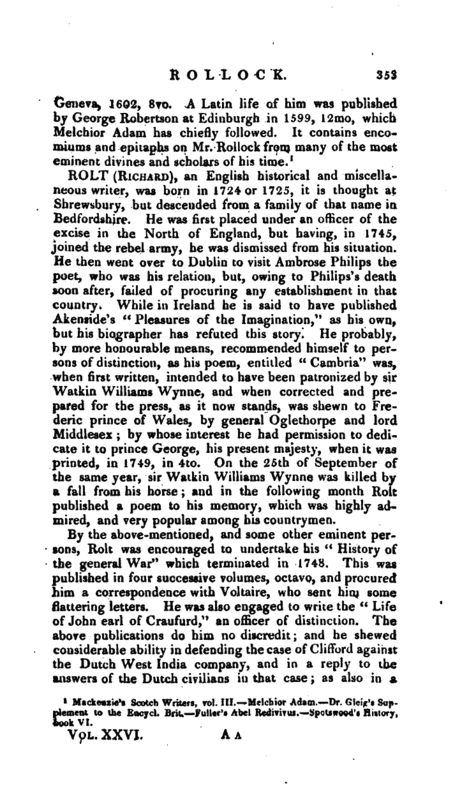 He was born in 1555, and learned the rudiments of the Latin language from Mr. Thomas Buchanan, who kept, says archbishop Spotswood, a famous school at that time, at Sterling, as we learn from Melchior Adam, who appears to have copied from the Latin life of Rollock. From school he was sent to the university of St. Andrew’s, and admitted a student in St. Salvator’s college. His progress in the sciences, which were then taught, was so great and so rapid, that he had no sooner taken his master’s degree than he was chosen a professor of philosophy, and immediately began to read lectures in St. Salvator’s college. This must have been at a very early period of life, for he quitted St. Andrew’s in 1583, when, according to Mackenzie, he had taught philosophy for some time. Not long before this period, the magistrates of Edinburgh having petitioned the king to erect a university in that city, he granted them a charter under the great seal, allowing them all the privileges of a university and the college being built in 1582, they made choice of Mr. Rollock to be their principal and professor of divinity. At what time he was ordained, or whether ordained at all, has been the subject of some controversy, but it is certain that he became famous in the university, and among his countrymen in general, for his lectures in theology, and for the persuasive power of his preaching for Calderwood assures us that in 1589, he and Mr. Robert Bruce, another popular preacher, made the earl of Bothwell so sensible of his vicious courses, that, upon Nov. 9, his lordship humbled himself upon his knees in the east church in the forenoon, and in the high church in the afternoon, confessing before the people, with tears in his eyes, his dissolute and licentious life, and promising to prove for the future, another man. In 1593 principal Rollock and others were appointed by the parliament to confer with the popish lords; and in the next year he was one of those who, by appointment of the. general assembly of the church, met at Edinburgh in the | month of May, and presented, to his majesty a paper en titled “The dangers which, through the impunity of excommunicated papists, traffickers with the Spaniards, and other enemies of the religion and estates, are imminent to the true religion professed within this realm, his majesty’s person, crown, and liberty of this our native country.” In 1595 he was nominated one of the commissioners for the visitation of colleges, to inquire into the doctrine and life of the several masters, the discipline used by them, the state of their rents and living, and to make their report to the next assembly. In 1596, the behaviour of some of the clergy having drawn upon them the resentment of the king, Mr. Rollock was employed, on account of his moderation, to soften that resentment, and to turn his majesty’s wrath against the papists. In 1597 he was chosen moderator of the general assembly, the highest dignity in the Scotch church, and had the influence to get some abuses redressed. Being one of the fourteen ministers appointed by this assembly to take care of the affairs of the church, the first thing which he did was to procure an act of the legislature, restoring to the bishops their seats in parliament. 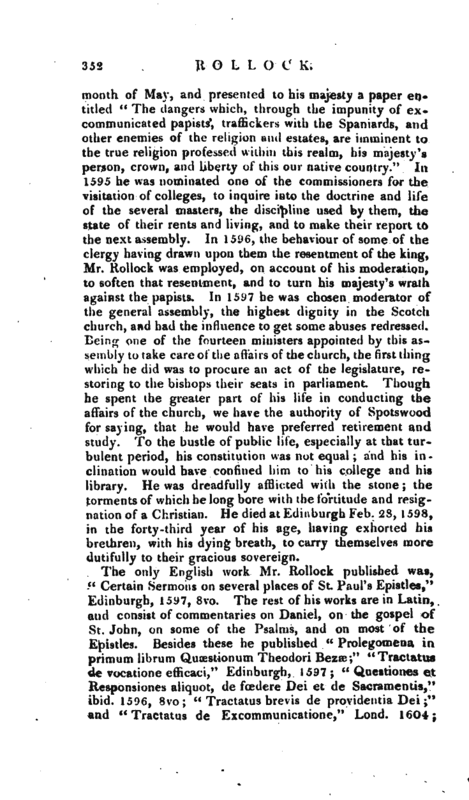 Though he spent the greater part of his life in conducting the affairs of the church, we have the authority of Spotswood for saying, that he would have preferred retirement and study. To the bustle of public life, especially at that turbulent period, his constitution was not equal; and his inclination would have confined him to his college and his library. He was dreadfully afflicted with the stone; the torments of which he long bore with the fortitude and resignation of a Christian. He died at Edinburgh Feb. 28, 1598, in the forty-third year of his age, having exhorted his brethren, with his dying breath, to carry themselves more dutifully to their gracious sovereign. Mackenzie’s Scotch Writers, vol. III. —Melchior Adam. Dr. Gleig’s -Supplement to the Eucycl. Brit. Fuller’s Abel Rtdiwus. Spotswood’s History book VI.